Emergency medical services (EMS) commonly perform endotracheal intubation (ETI) or insertion of supraglottic airways, such as the laryngeal tube (LT), on patients with out-of-hospital cardiac arrest (OHCA). The optimal method for OHCA advanced airway management is unknown. 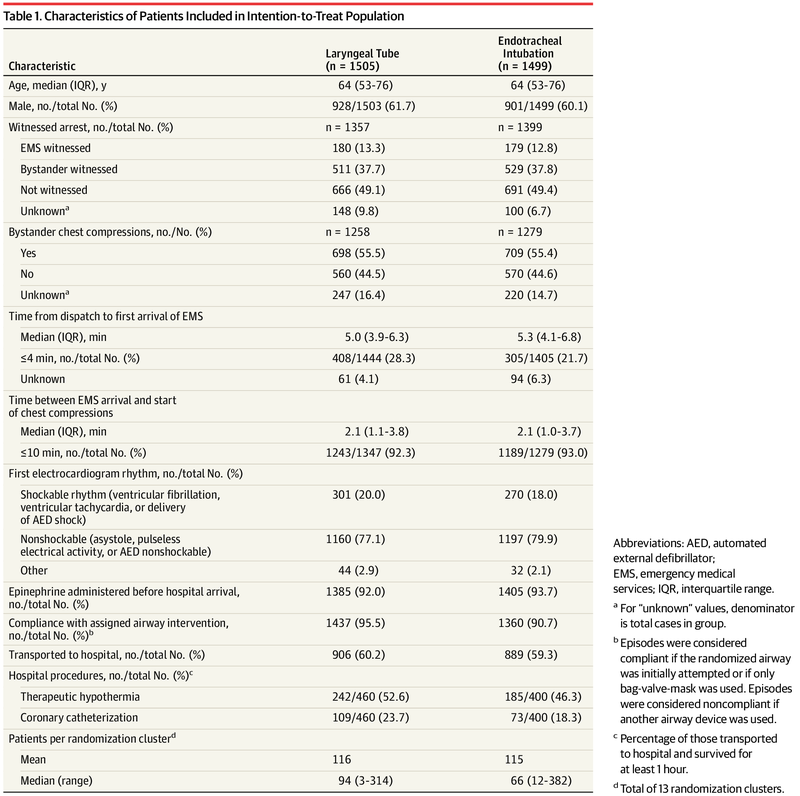 To compare the effectiveness of a strategy of initial LT insertion vs initial ETI in adults with OHCA. Multicenter pragmatic cluster-crossover clinical trial involving EMS agencies from the Resuscitation Outcomes Consortium. The trial included 3004 adults with OHCA and anticipated need for advanced airway management who were enrolled from December 1, 2015, to November 4, 2017. The final date of follow-up was November 10, 2017. 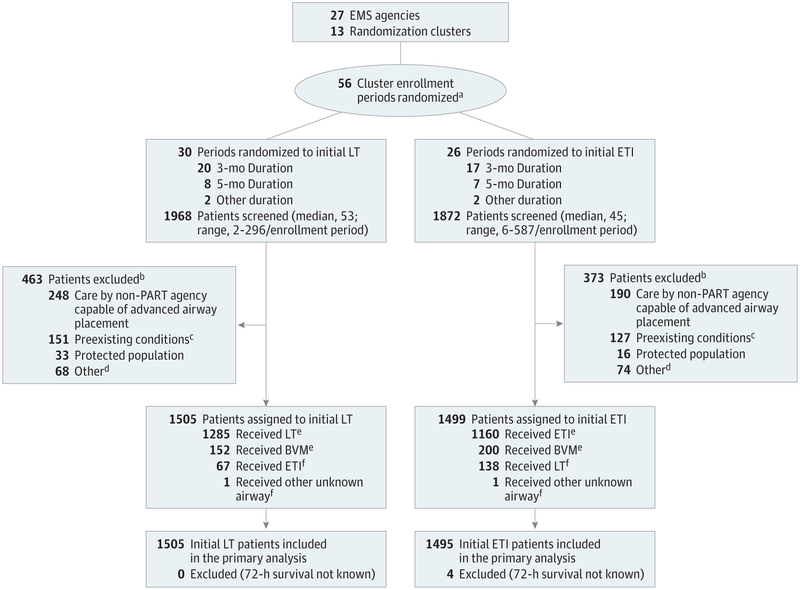 Twenty-seven EMS agencies were randomized in 13 clusters to initial airway management strategy with LT (n = 1505 patients) or ETI (n = 1499 patients), with crossover to the alternate strategy at 3- to 5-month intervals. The primary outcome was 72-hour survival. 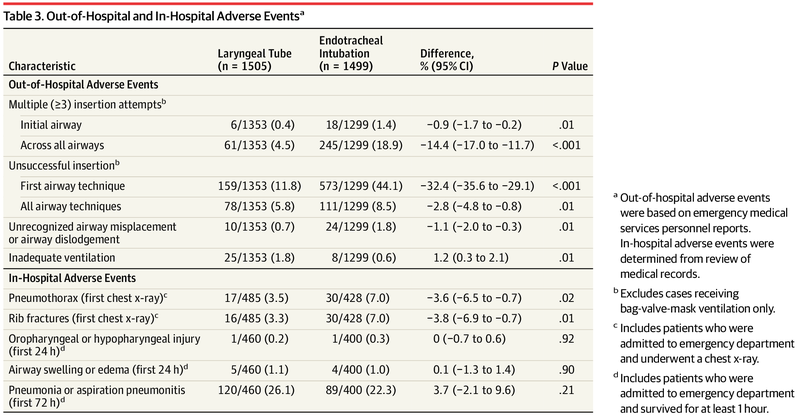 Secondary outcomes included return of spontaneous circulation, survival to hospital discharge, favorable neurological status at hospital discharge (Modified Rankin Scale score ≤3), and key adverse events. Among 3004 enrolled patients (median [interquartile range] age, 64 [53-76] years, 1829 [60.9%] men), 3000 were included in the primary analysis. 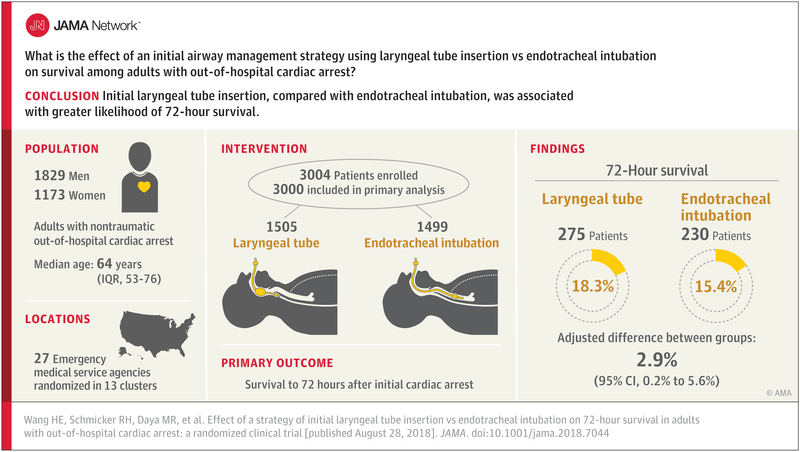 Rates of initial airway success were 90.3% with LT and 51.6% with ETI. Seventy-two hour survival was 18.3% in the LT group vs 15.4% in the ETI group (adjusted difference, 2.9% [95% CI, 0.2%-5.6%]; P = .04). Secondary outcomes in the LT group vs ETI group were return of spontaneous circulation (27.9% vs 24.3%; adjusted difference, 3.6% [95% CI, 0.3%-6.8%]; P = .03); hospital survival (10.8% vs 8.1%; adjusted difference, 2.7% [95% CI, 0.6%-4.8%]; P = .01); and favorable neurological status at discharge (7.1% vs 5.0%; adjusted difference, 2.1% [95% CI, 0.3%-3.8%]; P = .02). There were no significant differences in oropharyngeal or hypopharyngeal injury (0.2% vs 0.3%), airway swelling (1.1% vs 1.0%), or pneumonia or pneumonitis (26.1% vs 22.3%). 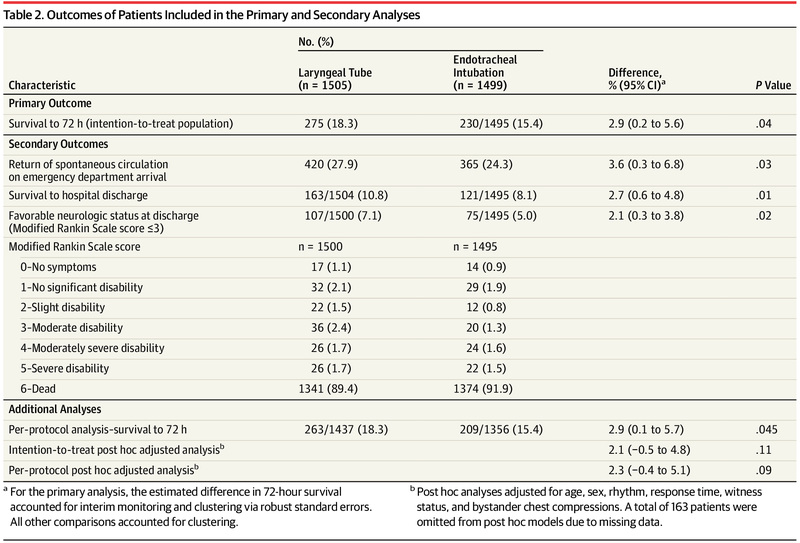 Among adults with OHCA, a strategy of initial LT insertion was associated with significantly greater 72-hour survival compared with a strategy of initial ETI. These findings suggest that LT insertion may be considered as an initial airway management strategy in patients with OHCA, but limitations of the pragmatic design, practice setting, and ETI performance characteristics suggest that further research is warranted.